The years-long New York Times bestseller and major motion picture from Spielberg’s Dreamworks is “irresistible…seductive…with a high concept plot that keeps you riveted from the first page” (O, The Oprah Magazine). M.L. Stedman was born and raised in Western Australia and now lives in London. The Light Between Oceans is her first novel. 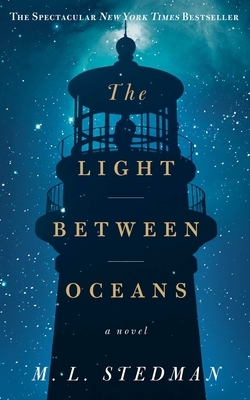 Discuss the novel’s title, The Light Between Oceans. Why do you think the author selected this title? What do you visualize when you hear or read The Light Between Oceans? The novel is rich with detailed descriptions of the ocean, the sky, and the wild landscape of Janus Rock. Is there a particular passage or scene that stood out to you? What role does the natural world play in Tom and Isabel’s life? “The isolation spins its mysterious cocoon, focusing the mind on one place, one time, one rhythm—the turning of the light. The island knows no other human voices, no other footprints. On the Offshore Lights you can live any story you want to tell yourself, and no one will say you’re wrong: not the seagulls, not the prisms, not the wind.” (page 110) Discuss the impact of living in seclusion on both Tom and Isabel. Why do you think each of them is drawn to live on Janus Rock? Do you think, in the moments when we are unobserved, we are different people? When Isabel tries to get Tom to open up about his family, he responds: “I’ll tell you if you really want. It’s just I’d rather not. Sometimes it’s good to leave the past in the past.”(pages 44-45) Do you think it is possible to leave the past in the past? What do you think of Tom’s opinion that it’s a “pity” that we’re a product of our family’s past? What does this tell you about his character? Discuss the impact of family history on Tom, Isabel, Hannah, and Frank. Tom is haunted by what he witnessed—and what he did—during his enlistment in World War I. The narrator reflects that he’s not “one of the men whose legs trailed by a hank of sinews, or whose guts cascaded from their casing like slithering eels….But he’s scarred all the same, having to live in the same skin as the man who did the things that needed to be done back then.” (page 10) How do you think Tom’s experiences as a soldier impact his decisions throughout the novel? What other outside elements, like the war, influences the narrative? Janus Rock is named for Janus, the Roman God of doorways, “always looking both ways, torn between two ways of seeing things.” (page 65) How does this knowledge impact your reading of The Light Between Oceans? Who is “torn between two ways of seeing things”? Discuss the theme of opposites in The Light Between Oceans—darkness and light; safety and danger; land and water; truth and lies. How do these opposing forces shape your reading? When Isabel brings Tom the map of Janus, complete with new names for all the locations on the island, Tom has an interesting reaction: “Janus did not belong to him: he belonged to it, like he’d heard the natives thought of the land. His job was just to take care of it.” (page 62) Discuss the difference in Tom’s point of view compared to Isabel’s. Does this difference in opinion foreshadow future events? How does it relate to their conflicting opinions of what to do with Lucy? Did you sense that the silver rattle might turn out to play a pivotal role in the story? Tom believes that rules are vital, that they are what keep a man from becoming a savage. Do you agree with him? Which characters won your sympathy and why? Did this change over the course of the novel? Did your notion of what was best or right shift in the course of your reading? Tom and Isabel’s deception impacts the lives of everyone around them. What did you think of the other characters’ reactions when they discover the truth about Lucy? Consider Hannah, Gwen, Septimus, Isabel’s parents, Ralph, Bluey. Discuss Hannah’s reunion with Grace. Do you think she had fair expectations? Did you agree with Dr. Sumpton’s advice to Hannah about completely cutting Lucy off from Isabel and Tom? M.L. Stedman makes it clear that there is no one perfect answer to the question of who should raise Grace/Lucy. She seems to undermine all notions of absolutes. It is clear that she will not dismiss all Germans as evil either. There is Hannah’s husband, ripe for persecution, and yet he is utterly innocent. Discuss the places in the novel where easy certainty turns out to be wrong. Were you surprised by Isabel’s final decision to admit her role in the choice to keep Lucy—freeing Tom, but losing her child forever? Why or why not? What would you have done? What did you think of the conclusion of the novel? What emotions did you feel at the story’s end? Did it turn out as you expected? Were you satisfied?